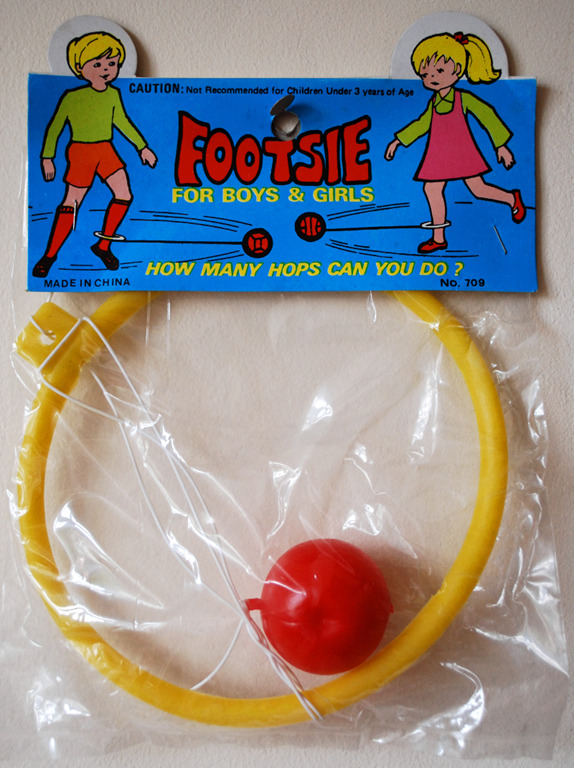 Do you remember the Footsie toy? This little plastic hoop slid up (loosely) around your ankle. There was a cord attached, with a little plastic bell shape at the end of the cord. 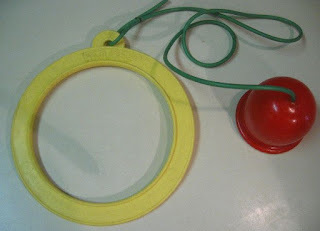 You would get the cord (and bell shaped attachment) going around and around, and hop each time it went toward your other foot. In a way this worked like a little hula hoop. It was a great playground fad in the late 1960's - early 1970's. This simple toy provided lots of fun on the playground. Anyone remember this? I wonder if a version of this toy is still around? I remember this! My cousins and I use to see how mnay we could do without tripping up. It was blast! I had a similar toy in the mid 60's. It was called the Jingle Jump. I do remember this! I never had one, but I do remember seeing it. Thanks for stopping by! Dianne, neat about Jingle Jump - that is a great name. I had one in the early 70's. Bought it at Woolworth's! I LOVED it! Am trying to find one! We all had them and would play with them for hours. We loved it. I wish I had kept mine.